I saw a post recently from Eden Rudin, a travel blogger, about Vietnamese egg coffee. Just watching the video she shared from fellow travel bloggers at 2foodtrippers.com made my mouth water. Watch the video here for some history and the Vietnamese café experience. Well, after learning of the ingredients I decided to make a healthier version of this yummy drink. For all of you that have coffee and skip breakfast, this is a great way to add some healthy fats and vitamins A&D for a better start to your day. Pour hot water in to coffee cup to heat and place cup in bowl of hot water. It’s important to keep the cup and coffee hot because the cream mixture will be cool. Brew coffee using your usual method. I like the French press or pour over methods. Blend all ingredients except coffee for 2 to 5 minutes (more time equals fluffier mixture) with immersion whisk or blender. Replace water in cup with coffee. Gently pour egg cream mixture over coffee and allow to sit for a minute to warm. Makes 1 serving. Oh, is this good! I was going to look for another entry on Toni’s blog and didn’t get past this one. It works for espresso, too. This morning there was about 3 minutes to throw it together, but I was gifted one of those little Nespresso espresso machines for Christmas, just the thing to have when you can’t pay attention to what you’re doing. I plunged my coffee cup into a pot of water that had been simmering, and frothed the cream with the rest of the ingredients. When the cup was good and hot, I put it under the espresso dispenser and pushed the button, then poured in the egg-cream froth. Wow! This must be the closest thing to virtue where coffee is involved. 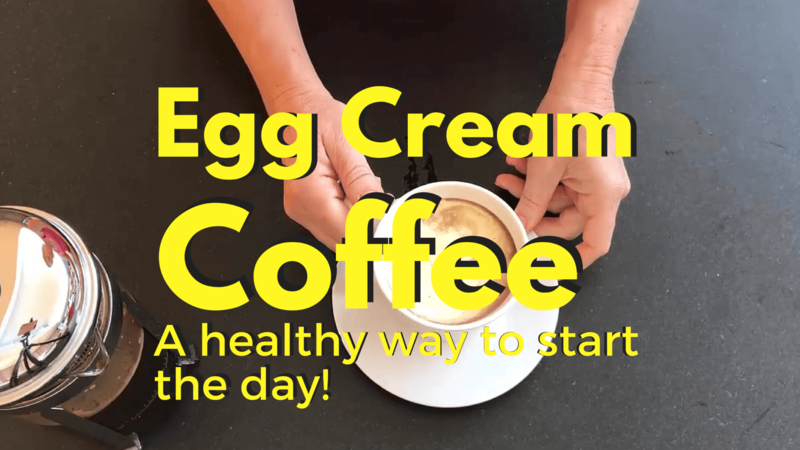 (I think an egg latte would be good, too, if you used lots more milk instd of cream, but you’d have to heat the milk if you’re using that much, and then it’s no longer raw–you may as well use pasturized milk. Maybe make a cold egg latte in the summer! raw milk, raw yolk, even some ice cubes, and you’re virtuous again : ) But the yolks have to be from clean, pasture-raised chickens (or something like that), right Toni? I cut the rest of the recipe in half for espresso since there’s only about 2 tablespoons espresso.